Taxi service is a bit different in Russia, given the large number of “pirate” taxi drivers that exist in the country. 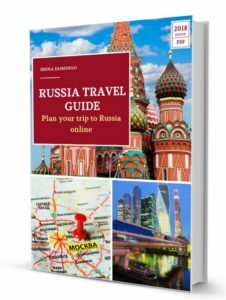 In this entry I explain how to catch a taxi in large Russian cities like Moscow or Saint Petersburg and provide recommendations on how to do it and how not to. On trips through the center of large cities like Moscow or Saint Petersburg, the option that I prefer to use is the Metro. It is fast, safe, and cheap. However, taxis are a good transportation method for trips from the airport or other places where there is not a good connection to the Metro system. The most basic way to catch a cab in any city in the world is to do so on the street. Lift your hand and wait for a taxi to come to you. The problem with this option is that two different types of taxis could come: illegal taxis (or “pirates”) and the official ones. In Moscow, it is said that for every official taxi there are 3 illegal ones. Every car that you see on the street is a potential taxi. This is a phenomenon that has arisen over the 90 years since the fall of the Soviet Union, which required people to earn a living somehow. Many people became illegal taxi drivers, a phenomenon that still persists today despite efforts at regulation. If you signal with your hand for a taxi to stop in Moscow, it is a certainty that one of these illegal taxis will drive up. The procedure is the following: the car will come up to you and the driver will offer to take you where you are going for a negotiable price. You should negotiate the price in advance (if you do not negotiate before, the trip can end up being more expensive). The problem is that if you are a foreigner and you do not speak Russian, the taxi will try to charge you a higher rate. It is also possible that you will see a second car stop and wait behind the first one in the hopes that your negotiations will fall through. In many cases these taxis are citizens of the former Soviet Republics in the East and the models of their cars can also be very old (Lada) or sometimes modern cars. Personally I do not advise taking illegal taxis. It is possible for it to end up being cheaper, but sometimes it is possible that it can end up being more expensive and also not as safe. Besides the illegal taxis, you can also get an official taxi on the street as well. These taxis are usually yellow and have a visible sign that says TAXI, but there are also other colors as well. Catching a cab this way is basically the same all over the world. Lift your hand so a taxi will know to stop, get in, and tell them your destination (if you have it written out in Russian, even better), the taxi driver will start the meter, and at the end of the trip you pay. Another option is to reserve a taxi in advance by telephone. The problem with reserving a taxi by phone is that you have to know Russian although with some companies it is possible that they have some staff that speak English. 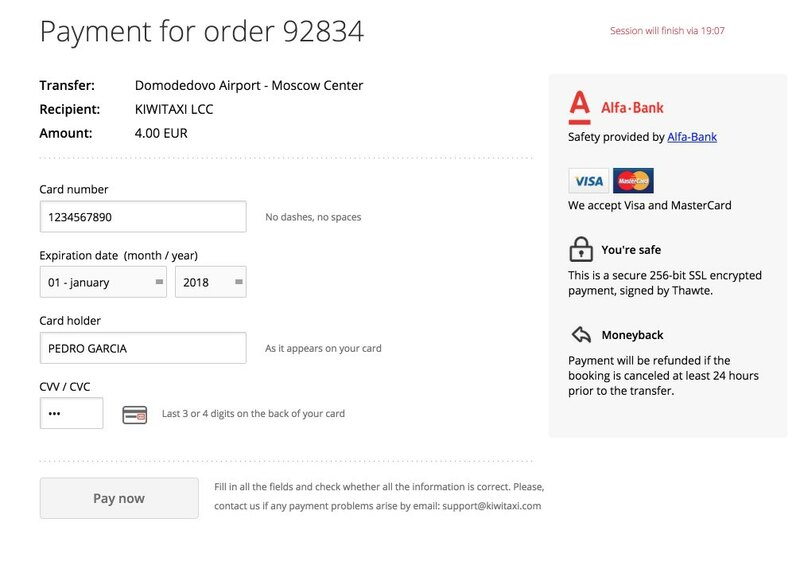 In these cases it is preferable, if possible, to ask the hotel receptionist to make the reservation for you (or any other person that you trust who speaks Russian). In the following part I include a list of known taxi companies with whom you can make a reservation by pone and, in some cases, online. 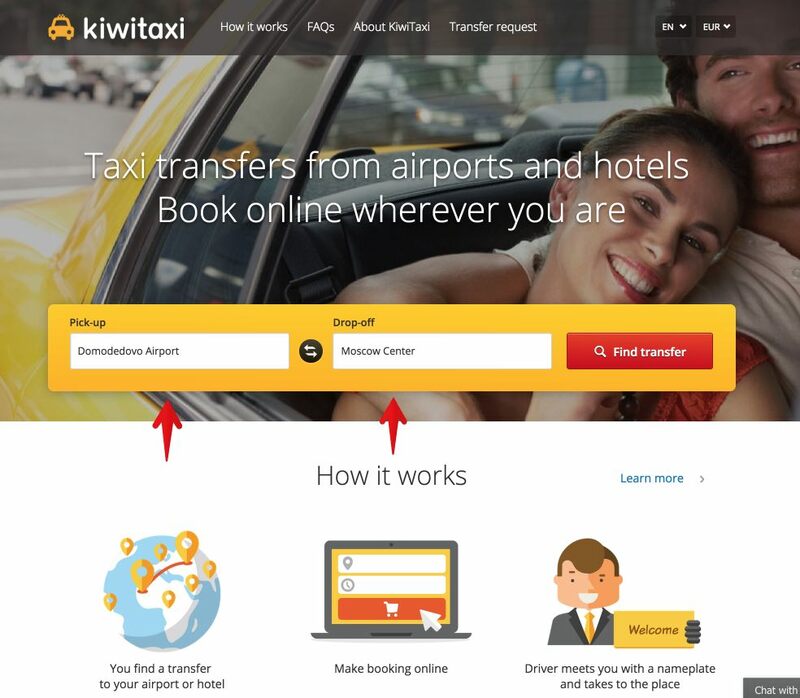 There are many companies that allow you to reserve a taxi through the Internet. 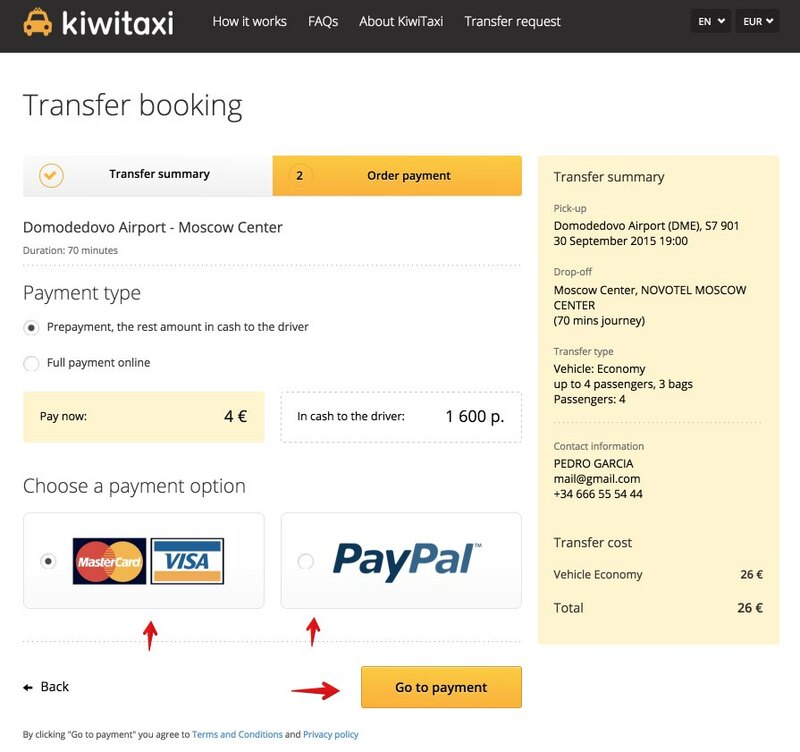 This is an easy way to reserve a taxi in advance of going from the airport to the city center (or whatever other site) knowing head of time what price you are going to have to pay (although not all company clearly specify their prices). Step 2. Select the type of car according to the number of passengers and level of comfort desired. You can choose between an Economy car for 4 people (VW Golf, Ford Focus, BMW 3, etc. ), a car with a higher level of comfort (VW Passat, Mercedes S-Class, Audi A7, etc. ), a minivan or a minibus. Step 3. 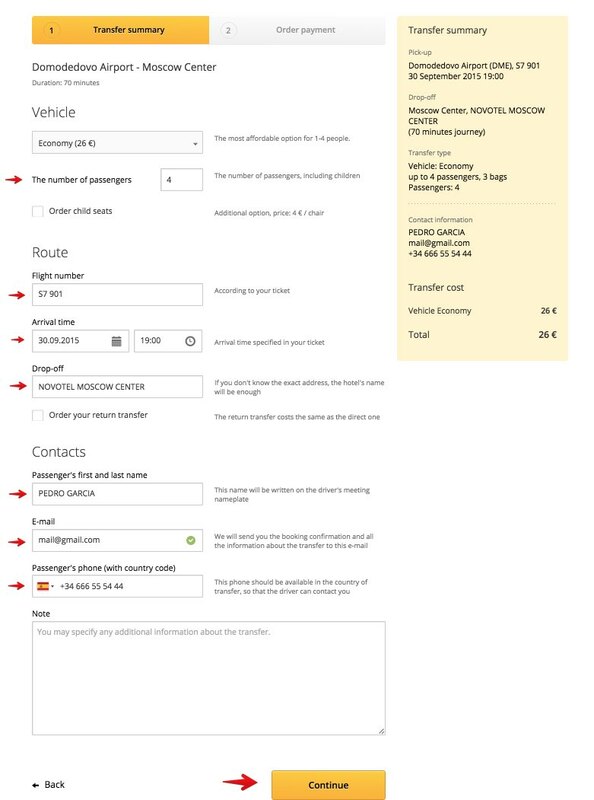 Enter the number of passengers, your flight information (flight number and date and hour of arrival), the name of your hotel or the address, as well as your contact information (name, email, telephone, and whatever other additional information you wish to provide). Step 4. In order to make your reservation you should prepay 4 dollars (although you can also choose to make the entire payment). The rest should be paid to the taxi driver in rubles (1,600 in this example). The payment can be made using your bank card (Visa or Mastercard) or through Paypal. If you cancel your reservation with 24 hours advance notice they will reimburse whatever payment you have already made. Step 5. They will send you an email confirmation for your reservation in which you can find a voucher with the details of your reservation. If the flight arrives late there should not be a problem since the taxi company should be monitoring your flight. A fourth option, which I have never used, is to call a taxi through an Android or iPhone mobile app, like Uber or Gett, which offer service in some Russian cities like Moscow and Saint Petersburg. 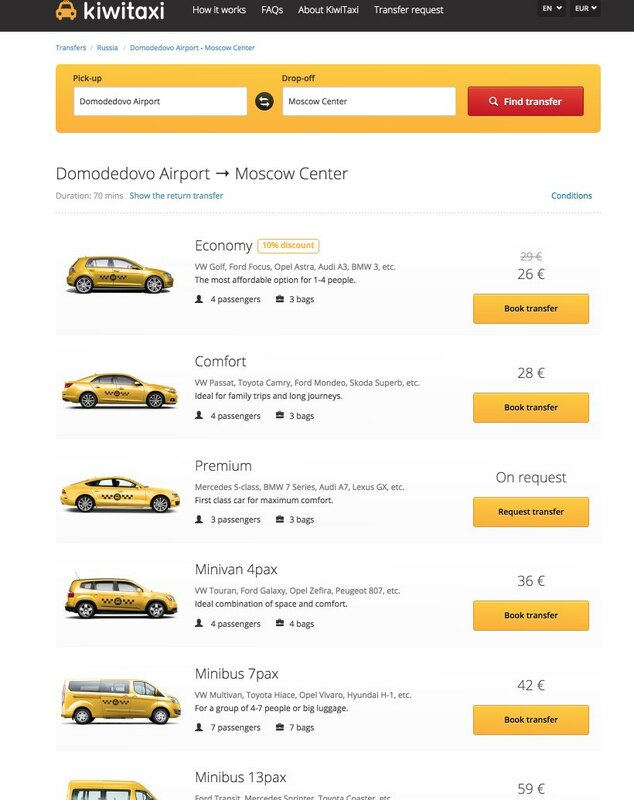 Another option is Yandex Taxi, although this is meant more for the local population.